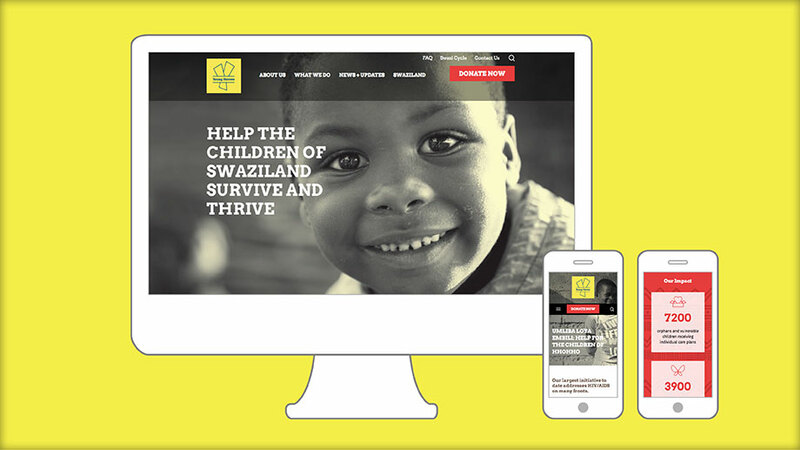 The work of the Young Heroes website team has been recognized by Graphic Design USA’s 2018 American Web Design Awards. Located in Swaziland, Africa, Young Heroes is a small nonprofit founded in 2006 by Steve Kallaugher that provides food, clothing and hope for HIV/AIDS orphans and vulnerable children – helping the children survive and thrive. The Young Heroes website was more than a decade old and required practical and brand positioning updates. Our journey to relaunch the site began with a small budget and a committed team who brought their talents together to bring this award-winning new site to life. My incredible website team included founder Steve Kallaugher, as writer and flexible collaborator; Senior Designer Jouna Saza, bringing her considerable knowledge in layout design and typography to realization; Wordpress Developer Alfredo Mercedes, contributing his deep expertise in creating a lightweight, responsive site accessible for slow and intermittent internet connections; Database Developer Brendan Butts, using his extensive skills in restructuring the database for a smoother user experience; and Principle Photographer Gary Irving, a longtime Young Heroes collaborator, generously providing his powerful portraits of the people of Swaziland as the focus of the site. Thanks to my colleagues for your dedication and commitment to this project and congratulations to all! Visit the Young Heroes website and view the Young Heroes brand page here.